There are a several events happening around Michigan that you should try to attend. First off, this Thursday Michigan Skeptics will be at the Skeptics in the Pub in Ypsilanti. It starts at 6:00 PM at the Corner Brewery and runs until about 9:00 PM or when the last person leaves. Next, There is a Skeptics in the Pub in Flint at the Empress of China. This starts at 6:30 PM and ends at 9:30 PM. If you’ve never been to a Skeptics in the pub this is a great opportunity for skeptics to talk, share ideas (and yes, drink) in a casual, relaxed atmosphere. We discuss the issues of the day and whatever else is on our minds. But most of all, we have fun while promoting skepticism, science, and rationality. Don’t drink? Don’t let that stop you from joining us! Some of the world’s most famous skeptics are teetotallers, and we are happy to have you! And finally this week Brian Gregory will be hosting another wonderful Virtual Drinking Skeptically on Friday at 9:00 PM. This week’s guest will be Brian Thompson. He is the host of “The Amateur Scientist Podcast“ and has written for several publications. So maybe the last one wasn’t technically a Michigan event… You can attend it from Michigan! It counts, trust me. Remember you can always find out about events at our calendar page. Plus if you have an event coming up, please let me know and I will be happy to post it. We are also working on putting together our first get together which is going to happen sometime in August. There’s been a bit of discussion on it over on our Facebook page. Or you can just follow us on Twitter. I hope to see you at the pub! This Logo was created for the Stop the AVN Facebook group. I recently posted about the Australian Vaccination Network, and anti-vaccination group and the recent findings against them from the HCCC. They found that the AVN provides misleading information and vaccinations and ordered them to post disclaimers stating that they are clearly anti-vax and that the information is not provided by medical professionals. Many people, including myself, thought the order was a little weak considering they were also found to have harassed a young family whose daughter died of Pertussis (Whooping Cough) at 32 days old. Initially I was somewhat disappointed to learn the ruling from the HCCC was no more than a requirement to post a disclaimer on the AVN website, but as the news has spread, I am somewhat buoyed by what has been happening. The HCCC ruling states that the AVN has 14 days to post a disclaimer clearly stating their website is anti-vaccine and that any information on the website should not be construed as medical advice. Seems like a slap on the wrist right? At first yes, but since the story has spread across the webosphere, an unexpected result has emerged and one that makes me very pleased indeed. Everywhere across the media, the AVN are now being referred to as anti-vaccine. Australia’s anti-vaccine organisation, the anti-vaccination network, and asked repeatedly why they are anti-vaccine. Regular readers of this blog will shrug and say, yeah we already knew they were anti-vaccine Maggie, so what? But what you may not know is that many people, especially vulnerable non-science educated parents and the media did not. Like the majority of anti-vaccine groups, the AVN have gone to great lengths to conceal their true beliefs from the public and especially the media – and the reasons why are obvious. Their rhetoric generally consists of “we are pro-choice”, “we want to empower parents to make a decision by providing both sides of the story”, “we provide a balance”, “we are pro-information, blah blah informed choice” etc. You know the drill. And although it has been blindingly obvious to anyone who knows how to use teh internets, for many busy producers, journalists and the like, the AVN has been their first port of call for “balance” (or rather false balance) simply because they didn’t know any better. Well, never fear dear readers, things they are a-changing. It turns out that this ruling has been nothing but good for not only the Skeptic community and Australia but for the entire world. It just got a little harder to lie to the public about your conspiracy theories. If you have not seen the news segment that Lateline did, you can view it in our forums here. On this day in 1798, President signed The Alien and Sedition Acts into law, making it illegal to criticize the government, any elected official or any appointed official. At that time France and the United States were in a heated conflict. Just 22 years earlier they were allies in American Independence. The conflict put a strain on the newly formed nation. The Federalist Party, run by Alexander Hamilton and of which John Adams was a member of, believed that resident aliens would support France and that dissent from the Democratic-Republican Party, the opposition party, was subversive. In an effort to expel foreigners and quiet dissent, they passed four acts which became known as The Alien and Sedition Acts. The Naturalization Act, enacted June 18, raised the numbers of years in residence required for citizenship from five to 14 years. The Alien Friends Act, enacted June 25, allowed the president to deport any alien deemed to be “dangerous to the peace and safety” of the U.S. The Alien Enemies Act, enacted July 6, allowed the president to deport any alien from a country at war with the U.S. The Sedition Act outlawed conspiracies “to oppose any measure or measures of the government.” It made “false, scandalous and malicious writing” against Congress or the president punishable by fine or imprisonment. The Sedition Act was set to expire on March 3, 1801, the last day of Adams’ presidency. Federalists contended that it was necessary to ensure that Adams could fulfill his obligations as president without interference. At least 26 critics of the Adams administration, ranging “from the editor of the most influential opposition newspaper in the nation to a New Jersey resident who drunkenly jeered” Adams, would be tried under the Sedition Act between 1798 and 1801, writes Bruce A. Ragsdale, director of thr Federal Judicial History Office. The New South Wales, Australia Health Care Complaints Commission (HCCC) has written a report on Australia’s largest anti-VAX group, The Australian Vaccination Network (AVN). The AVN is run by Meryl Dorey out of her home in Bangalow, NSW which is two hours south of Brisbane. They have a magazine, a website and host seminars. The Australian Skeptics have long been a thorn in the side of the AVN. In August of 2009, they ran a quarter page advertisement in a national newspaper stating the AVN is spreading misinformation and risking the lives of children. “The campaign aims to just alert parents to this information and pointing them to a number of places where they can find factual information about all these issues and these are very serious issues,’ Mr Mendham said. “I mean, the sceptics deal with a whole range of different areas from the fun areas to the serious ones and this one’s on the very, very serious end of it, we’re talking about children’s deaths here,” he said. “A lot of people (are) no longer vaccinating their children based often on information that we considered misinformation or misunderstandings,” Mr Mendham said. In March of 2009, Toni and Dave McCafferty’s 32 day old daughter, Dana died of Pertussis (Whooping Cough). She was too young to be vaccinated against it. They live in an area with one of the lowest rates of childhood vaccination in the nation. They also live a few minutes South of Maryl Dorey’s home and AVN headquarters. They claim that the AVN and Dorey have harassed them ever since their daughter died. “Our daughter wasn’t even buried and it began,” Ms McCaffery said. An email from Paul Corben, the director of Public Health at the North Coast Area Health Service, backs up Ms McCaffery’s claims. In the email, Mr Corben says Ms Dorey called him on March 12 seeking details of Dana’s death and accusing him of misleading the public by attributing the cause to pertussis. Ms Dorey denies the claims. She repeatedly says Dana “supposedly” died of pertussis, but the McCaffery’s say that is an offensive claim. They have made their own complaint the the HCCC about the AVN and Dorey and continue the speak publicly for vaccination and say the AVN continues to publish false and hurtful comments about them. The AVN has been given 14 days to comply with the HCCC’s findings and place a statement on their website telling consumers they provide anti-vaccination information and that the information should not be read as medical advice. The video of the news segment and a full transcript can be found inside the forums here. As the duly appointed guest host of VirtualDS #34, it falls upon me to write up the blog post. First off let state how unbelievably jealous I am of Brian to be able to go to TAM 8 while I was stuck at home! The video chat was fun as usual but there were not as many attendees because of everyone being at TAM and the chat starting at Midnight EDT. The virtual members include: Adam Bourque @a_damn_bourque, Brian Gregory @briandgregory (he was of course enjoying himself at TAM and running the mobile rig, more on that later), Skeptic Cat @skepticcat, Jason Brown @drunkenmadman, Nicole @NoisyAstronomer, Josette Martin popped in and out, Kylie Sturgis @podblack and Steve Thoms, @SomeCndnSkeptic, graced us with a return appearance! The main topic was of course, TAM. Which was also the reason the chat was held 3 hours later than usual. Everyone was busy getting their drink on in Vegas! Brian had set up a mobile rig and brought it to the hotel lounge where the massive Drinking Skeptically was happening. There were many people that got to say hi on the chat from the lounge. I was quite happy to be there (virtually at least) to be able to say hi to them. The people we got to say hi to in Vegas are: Massimo Pigliucci, Brian Engler, Barry Karr, Jo Benhamu, Ken Frazier, Jarrett, Richard Saunders, Tim from Minnesota, Curtis Haymore, Phil Plait (who thinks we shouldn’t drink the virtual water) and Patrick from SLC. Steve Thoms’ hilarious photos from Skepchickcon. An explanation as to what a “Kegstand” was for Jason. People are taller than Skeptic Cat on Purpose. Kylie and Dawkins: From the Global Atheist convention. Don’t ask skeptic cat about pancakes. Brian got his “Swarm” badge on 4Square. Before Photoshop, faking images was an art. Weekly World News is nothing now. The next VirtualDS is scheduled for July 16th at 9pm EDT (two days before my birthday) and will have the ultra amazing Heidi Anderson and a special guest. Be sure to mark your calendars, this one should get interesting. This Thursday, July 8th, I will be guest hosting a special late night Virtual Drinking Skeptically! Drinking Skeptically is an informal social event designed to promote fellowship and networking among skeptics, critical-thinkers, and like-minded individuals. These “real life” groups meet around the country to provide an opportunity for skeptics to talk, share ideas (and yes, drink) in a casual, relaxed atmosphere. “Virtual” Drinking Skeptically is an attempt to bring the social experience of DS online. Using multi-user video conferencing software, we meet weekly to discuss skeptical topics, hang out, act silly, and/or drink. Since I found out about it several months ago, the VDS has been an addiction of mine. I’ve been able to meet several people that I’ve been a fan of including Derek and Swoopy of Skepticality and Desiree Schell of Skeptically Speaking. For anyone that wants to learn about or participate in the skepticism movement (yes we’re a movement damnit!) this is a good place to learn and converse. You can find out more about the Virtual Drinking Skeptically at it’s homepage, it’s Facebook page or follow it on Twitter. 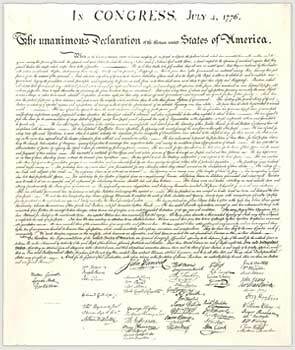 The above image of the Declaration is taken from the engraving made by printer William J. Stone in 1823 and is the most frequently reproduced version of the document. The holiday weekend marks 234 years since Thomas Jefferson’s draft of The Declaration of Independence was adopted. This morning NPR, as they have for the past 22 years read it aloud over the air. Hearing the text over the air reminded me of how many people have been referring to this document and even waving around cheap replicas of the document for their own purposes. Purposes which usually doesn’t even relate to the historic document. Not only is the deliberate destruction of history a dangerous thing, it also creates the opportunity to falsify accounts and completely wipe out portions of the past that overseers don’t like. In August 2007, Vladimir Putin and the Russian Parliament approved new laws which gave them sweeping powers to completely change history books. Putin stated his goals were to make history more “patriotic”. The new book calls Joseph Stalin a “contradictory” figure, and states that while some people consider him evil, others recognize him as a “hero” for his role in the Great Patriotic War (the Second World War) and his territorial expansion. All of us as critical thinkers, as skeptics, as humanists and most importantly as Americans are responsible to ensure and enforce an accurate and enduring historical record. I am a firm believer in recording as much as possible and saving everything for posterity. I don’t think anyone could know what would be of importance to later generations. The most accurate and complete historical is crucial for proper hindsight. Interesting times indeed. There are 13,00 TONS of records stored from World War II. We’ve barely scratched the surface of what we could learn from them. Imagine what we could still learn from those few short years. So I think that every person in our nation has a responsibility to learn our history and the history of the world. I think the best place to start this weekend is with The Declaration of Independence. I’m not going to post the full text here in this blog but you can find it online at The National Archives. Start with the that. Then move on the the Constitution and then to the Bill of Rights. These documents are what people are waving in the air. I think we all need to remember what they mean. Since 1996, Camp Quest in Clarksville, Ohio has been emphasizing critical thinking and the scientific method. It is a residential camp (campers sleep in cabins on site as opposed to day camps where kids go home every night) for kids of Atheists, Agnostics and Humanists. Although all children are welcome. The camp rents space from a 4-H camp in Clarksville. The Ohio camp is the largest, with 78 campers, but there are camps held in Michigan, Minnesota, Tennessee, California, Texas, Ontario, and the UK. There will be a camp opening in Ireland soon. In a recurring gag, counselors tell the kids that two invisible unicorns run free at Camp Quest. Anyone who can prove that isn’t true will win a prize. The kids learn that you can’t prove a negative, such as God doesn’t exist, Metskas said. The burden of proof should be on those who say he does. The challenge is a “fun, silly way to take on a serious conversation these kids will run into over and over again in real life,” she said. Co-Founder Helen Kagin who died on February 17th at age 76 wanted to give “children from non-theistic families a place to belong.” It was operated by the Free Inquiry Group of Cincinnati and Northern Kentucky. Helen and her husband Edwin served as camp directors until they retired in 2005. Camp Quest is now incorporated and an independent 501(c)(3) educational non-profit and operates the Ohio camp. The other camp location are independently run though coordinated with Camp Quest, inc.
Juliana Panteloukas, 13, of New York, said most of her friends at home are religious. Campers and staff “do talk sometimes about how silly … different religions are and what they have to do,” Juliana said. With that, she went back to her lunch table, where preteen girls scarfed hamburgers and chips before an afternoon swim. There’s not really anything new here. It’s their usual homophobic, xenophobic, bible thumping policy. It’s clear just how far to the right the GOP is going. It’s not just the conservative base either; Republican Senate candidates like Nevada’s Sharron Angle and Kentucky’s Rand Paul have clear and abiding ties to the far-right, and congressional Republicans regularly espouse radical views that would have been anathema to nearly everyone a few years ago. There has been a great debate raging within the Atheist and Skeptic groups throughout the country. Should Skepticism be considered Atheist? I think two things need to be pointed out before I begin. First: Not all Skeptics are Atheists and not all Atheists are Skeptics. Second: I am an Atheist. I make this distinction because I wish to bridge the gap between Atheism and Skepticism. There are many who argue that there is no gap, and for some that may be true. The gap, as I see it, is a difference in the philosophies of how to take a stand on religion. While as an Atheist, I agree that the world needs more of us, but I do not think that the active attempt to “convert” people to atheism is right nor should it be an active goal of ours. As a Skeptic and as an Atheist, it is my opinion that treating a Skeptic organization as an “Atheist only” group harms the spirit and the idea of Skepticism. Skeptic groups and Skepticism in general should be open to all people. From Atheists who are very active in the Skepticism community to people that still have their faith but want to learn more about and how to apply critical thinking. The role of Skepticism should not be to attempt to “inform” people that still have faith. There are many groups that do that. Plus some can be quite loud and dogmatic. I do not want that to be the role of a Skeptic organization. We should be an inclusive group whose goals include education, debate, critical thinking, and outreach. The world needs more skeptics and we should be willing to provide the world with just what it needs. What we should be doing is providing evidence and debate on the issues we face. That includes everything we are facing today, from large issues like the massive oil spill in the Gulf and religious extremism to small issues like whether or not organic food is actually better for you. People should be able to, and need to make their own decisions. We have an obligation to be there to provide all options. To be able to highlight and participate in the debate. The Inverse is true for the Atheist groups. Is it right for a Skeptic to walk into an Atheist group and demand they apply the scientific method to their meetings? Many of us had to deal with the issue of “Atheist anger”. There are many good articles on dealing with it here and here. Is the anger justified? I think so. Atheists are one of the most hated groups in America. I often hear people chuckle with amusement when Atheists talk about “coming out”. They relate it to being homosexual, which is why I believe the term came to be used for us as well. The same (and sometimes worse) stigmas and repercussions apply. It is completely normal to be shunned and disowned by family and friends, to be treated differently and in some cases attacked or targeted by vandalism. I do however think it’s important to move past that anger and to put it to good use. While Skeptics add to the dialog and debate, Atheists outright challenge extremism, fundamentalism, corruption and religious control. That is a good thing and necessary in this country if not the world. So should Atheist and Skeptc groups be separate? Yes, and also no. The groups have different goals and methods, so they should be kept separate. There is no reason however, that a person can’t belong to both groups. I am a proud member of Michigan Skeptics (ok, founder), CFI, The Skeptics Society, Detroit Atheists, Detroit COR and Ann Arbor Atheists. I have friends that are religious and are Atheists. I’m married to a Deist. There’s no reason why our different groups can’t work together. We have similar goals and are at least heading in the same direction. Let’s close the rift. We should work together.